The Sound Town SWM20-U2HHV2 combines stellar sound and ease of use into a sleek handheld wireless microphone system which won’t break your bank. It comes with dual-channel up to 200 selectable UHF frequencies (530-580MHz). This helps minimize the chances of getting interference from other electronic equipment. 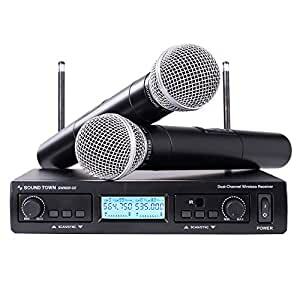 The two handheld wireless microphones employ a cardioid pickup pattern which yields superb sound feedback and isolates noises in the background. The Sound Town SWM20-U2HHV2 wireless system provides a great operation range up to 300 feet line-of-sight. Its two detachable antennas and quartz crystal oscillation stabilize frequency transmitting and receiving, so you can take the stage confidently. It is ideal for venues including meeting rooms, auditoriums, stages, schools, places of worship, etc. 1. Connect the SWM20 receiver to an AC outlet through the power adapter provided. Install the antennas to the receiver. 2. Connect the SWM20 receiver to a powered speaker or an amplifier with the 1/4â audio cable provided. Turn on the SWM20 receiver. 3. Put two alkaline AA batteries into the battery compartment of the microphone. 4. Power on the handheld microphone, after 3 seconds, there will be a frequency showing on the LCD screen. 5. Press the UP or DOWN button on the receiver until the frequency matches what the handheld microphone has on its screen. There are two channels on the receiver with different frequency ranges and use the channel that covers the frequency range of the microphone. 6. After selection is made, it becomes locked after 3 seconds. The LCD screen on the receiver now shows the battery life of your microphone. Use the volume knob on the receiver to adjust the volume.